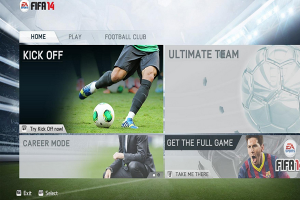 "The latest FIFA soccer game with many new features"
Elsewhere on Winportal you can find various previous FIFA game editions and here’s FIFA 14. It’s the latest soccer emulator and a variety of new elements are introduced in this edition which include precision movement, pure shot, protect the ball, real ball physics, ultimate team, team intelligence, co-op seasons and the global transfer network. As such, FIFA 14 builds on the previous editions of this well-known video game and by adding the aforementioned characteristics, more intelligence and precision makes the gameplay even more realistic. To this contribute also the team features, including run tracking and smarter marking, as now you can create a unique team according to your style. So, now you can play online with a friend against worldwide opponents and get ranked, and the traditional Match Day is now transformed into Co-op seasons. Last but not least, just like in the real professional soccer world, scouting is also incorporated on a worldwide level. The soccer fans among you should no longer wait and hit the download button right now to get the demo version of the latest FIFA video game release which will provide you with a limited gameplay to enjoy, which should give you a fair taste of all the new items it encompasses.